There are a great many variables that go into determining a Stanley Cup champion. Many of them are uncontrollable. Yes, talent reigns supreme, but more than any sport, fortune good or bad — pure, unadulterated luck — can swing a road trip in December or a series in May, almost all of which is unpredictable. So it can become a fool’s errand to try and predict in October how the hockey season will play out. That didn’t stop Sporting News’ team of hockey experts from trying. Here’s how we feel the regular season will finish, from division standings to playoff matchups and a Stanley Cup pick, based on information at hand. For the second year in a row, the Lightning draw a Metro crossover as the top overall seed. Critically, the Bruins swap out of the Bracket of Death. That more or less assures a Tampa-Toronto clash in the conference semifinals. The Flyers simply don’t have the firepower nor the goaltending to thwart the high-powered Bolts in this scenario. We at SN are high on the Panthers this season. And if they make it this far, the Maple Leafs will have their hands full with a well-structured, highly potent foe that, with Aleksander Barkov and Vincent Trocheck, can match up down the middle with Toronto, at least two lines deep. It would make for an entertaining series, one the Leafs ultimately would win. The last time the Penguins and Bruins met in the playoffs, Pittsburgh suffered an embarrassing sweep in the 2013 conference finals. It was also the last year Boston reached the Stanley Cup Final. Both teams have lofty aspirations in 2018-19, and the Bruins can’t catch a break, switching from the Atlantic bracket into the laps of the Pens. A rematch of last year’s fateful first-round series that sent the Capitals on their Stanley Cup trajectory and the Blue Jackets contemplating their awful playoff luck. Columbus had the misfortune of drawing the eventual Cup winners in the first round of each of the last two postseasons. Maybe the third time will be a breakthrough. Out of all the Western Conference’s playoff teams a year ago, the Wild feel like the one least likely to make it back. 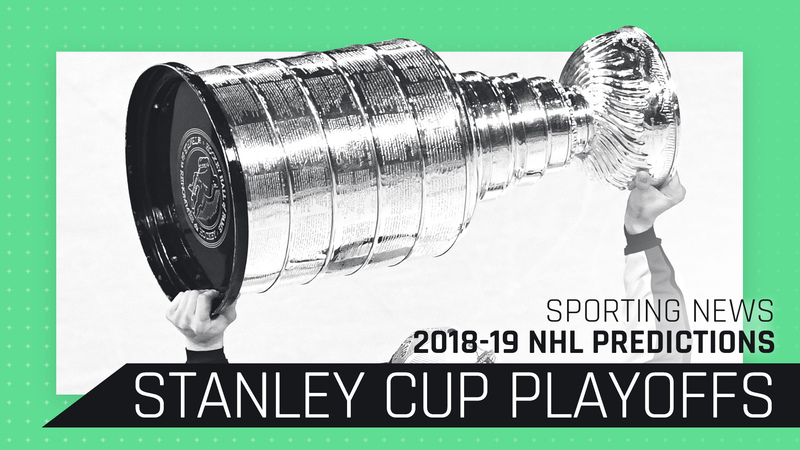 If they do, as our projections suggest, the pressure will be on coach Bruce Boudreau and Co. to avoid the franchise’s fourth consecutive first-round ouster. The Jets, meanwhile, are a popular Presidents’ Trophy pick. It’s a rematch of 2017, when Winnipeg made quick work of Minnesota. The revamped Blues are back in the playoffs after barely missing a season ago. But just getting in won’t cut it; the franchise is thinking much bigger, yearning for its first Stanley Cup Final berth in nearly 50 years. That’s going to be a difficult task coming out of the Central. The Predators, for one, are a legit powerhouse, and would still make quick work of the Blues, should this matchup become reality. The Sharks reportedly had the last, best offer on the table for Erik Karlsson after Western Conference rivals Vegas and Dallas balked at the asking price. Well, the Stars may find out first hand the difference a player of Karlsson’s ilk can make. Dallas slips into the playoffs in our projections, but its run won’t last long. As the Ducks were jettisoned from the playoffs a year ago, the Golden Knights were busy skating circles around the Kings in the first round. Anaheim has committed to a quicker style this season but that’s easier said than done and doesn’t happen overnight. I’m torn between Tampa and Toronto emerging from the cutthroat Atlantic portion of the bracket, but the Lightning get my nod for their superior defense corps. The four-deep rotation of Victor Hedman, Ryan McDonagh, Anton Stralman and Mikhail Sergachev is going to prove equally tricky for the Penguins (who will get back to their Capital-killing ways in the second round). Ultimately, the Bolts’ stars manage to outgun Sidney Crosby and Co. and return to the Cup Final. It’s Generation Next’s turn. The age of Auston Matthews, John Tavares and William Nylander (yep, he’ll be signed by then) will carry the Maple Leafs past Sid’s team and into their first Stanley Cup Final since 1967. The Jets once again can’t get over the hump and into the Final, despite the stellar play of Patrick Laine and Connor Hellebuyck. A determined Brent Burns, Joe Thornton and a rejuvenated Joe Pavelski ignite the Sharks as San Jose heads back to the Finals for the second time in four years. The Maple Leafs make the Final, but come up short as the youngsters fall under the pressure of winning Toronto’s first Stanley Cup in 51 years. Erik Karlsson leads the way in the last round as he sticks it to the Leafs one more time. Joe Thornton, after winning the Cup, retires as does his old teammate Patrick Marleau. The Leafs may lose, but be prepared Toronto, this loss leaves the young Leafs hungry and, you heard it here first, they’ll hoist the Cup in 2020.